March | 2010 | . 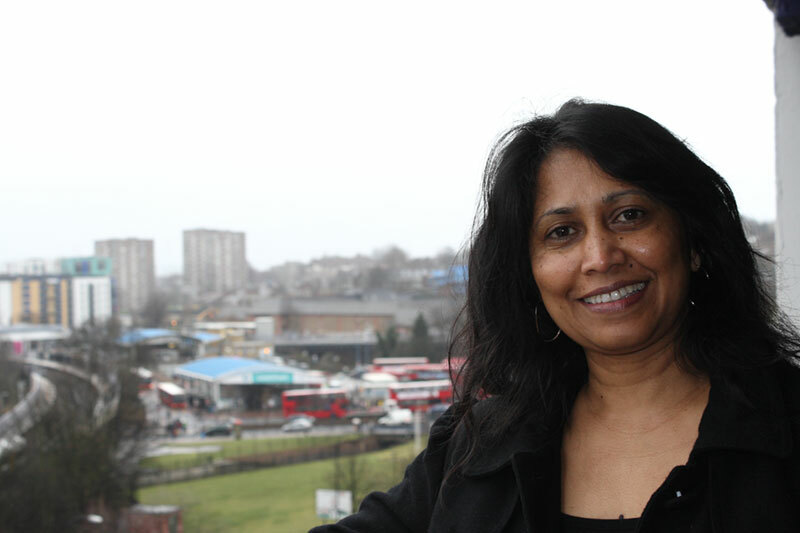 Ingrid Chetram is another of the Lib Dem candidates for Lewisham Central. I was born in Guyana, South America and moved to London when I was 24. I am now the proud mother of 3 teenage sons and work for a homeless day centre in Deptford SE8. I have 2 severely disabled brothers, both with speech impairments and one who is profoundly deaf. Therefore I have worked quite closely with Social Services and some service commissioners around care and disabled provision. They were both living with me for ten years and recently moved into registered care. I studied Media at Goldsmiths University, have a Diploma in Person Centred Counselling and more recently a Masters Degree in Clinical and Public Health Aspects of Addictions. My first job was as a secondary school teacher in Guyana for 8 years, then in London I worked for the NHS for 5 years and then at various Rehabilitation Centres; keyworking or counselling those who were homeless, disadvantaged, vulnerable, dependent on alcohol and or drugs, those with mental health unwellness, offenders, ex offenders, victims and perpetrators of domestic and sexual abuse and a plehtora of other issues.” I feel that with my combined personal and work experiences and being a mother of 3 growing sons in Lewisham, I can confidently represent Lewisham Central as a Councillor, as I am aware of the variety of issues affecting local life. I really want to share my knowledge and skills in assisting my fellow residents to access as much of the services as possbile and at the same time work for better and improved facilities in our borough. 6.16 As of the end of January 2010 cut-off date, 3699 First Preference applications had been received on time for the 3156 Reception places available. It’s impossible to exaggerate the impact of the numbers revealed in the Mayor and Cabinet papers of 24th February (link to document) and that the South London Press reports about today. The sobering news is that next year Lewisham will be short of 543 reception level primary school places. If we weren’t so close to an election the Mayor would have to be forced out of his seat for his inability to face up to the most basic needs of the community he is supposed to look after. This report to the Mayor is full of explanations about why we are where we are, but on the side of the administration there are no excuses, the fact is that they saw it coming, and didn’t rise to the challenge. Over 500 children and families will suffer greatly. A whole generation of Lewisham’s children will receive a reduced service, overcrowded classes, not enough teacher’s attention, insufficient play area. All of this at that most crucial stage of their education. As I said, the consequences are immense. I received further correspondance from TfL about my enquiries asking clarification on their position regarding the Courthill Road Junction. You are right, this section of the A21 between Courthill Road and Catford Town Centre is a particularly busy route. However, the impacts of installing a pedestrian crossing at Courthill Road cannot be viewed as simply holding a queue at one location rather than another. We must be sure that any queuing created as a result of this pedestrian crossing does not have significant impacts on other neighbouring junctions, not just on the A21 but also on local borough roads. So, it seems that the concern here is about Courthill Road and Withburn Road and whether a pedestrian light would make queses there longer than the current situation (note to self, ask to Head of Highways of Lewisham Council what he’s heard about this). As part of our previous investigations we built a model which replicates the operation of Courthill Road junction and nearby Ladywell junction which are both linked operationally. We are now testing the impacts of any changes of the junction to identify whether they are acceptable to both Transport for London and the London Borough of Lewisham. And that’s encouraging. Read the full letter here. P.S. : at point 1 the letter mentions an attachment with details of the recorded accidents. The attachment was actually missing, I have asked for those data again, both to TfL as well as to other contacts at City Hall and I’ll post that data here as soon as I receive it. What is the OLF Training Centre? The centre was orignally set up for our exisiting business of education for th fitness professional. However, when we moved to Hither Green we soon realised that the area was in need of a gym! So we put our heads together and cmae up with the following…..
St Mungo’s, the very large homeless hostel of Arlington Close (off Ennersdale Road) is hosting an open day event in conjunction with the Safer Neighbourhood Team for Lewisham Central. This event is set for next Friday 19th March, 4pm to 8pm. This will give you a chance to look around the hostel and see what work is carried out and ask questions, and speak with staff. The meeting will also give you the opportunity to meet members from our team and learn more about Neighbourhood Watch Scheme which would like to start in your area. This is a very welcome event, at the latest Safer Neighbourhood Panel meeting we were told that they had just established a positive line of communication with the hostel and this initiative is evidently the first fruit of that forward attitude of the local SNT team. There is an interesting letter in this week’s Mercury, it’s signed by a “Neil Watkins” who declares he just moved to this Borough. A quick Google of the keywords Neil Watkins and Lewisham and Labour clarified further where he comes from. A rank and file Labour Member whose Facebook profile puts in the UK Parliament network. Possibly a young researcher. I received a leaflet from the Lib Dems complaining about the level of council tax in Lewisham. I’ve recently moved to the borough and I can tell you that the boroughs with the highest council tax in London, Richmond and Kingston, are Liberal Democrat-run. Kingston’s Band D rate is 30 per cent higher than Lewisham’s, so I think a bit of perspective is required. Everyone in the UK pays council tax, so it’s worth knowing where we stand. We all know that what the Liberals say and what they do in power are two different things, but let’s hope we never have to find out in Lewisham. Now, since Mr Watkins is so politically aware, he must also have spotted that the Libdem literature informs people that Lewisham has the highest Council Tax of all Inner London Boroughs. And that is entirely true, as it is true that Mr Watkins craftily manages to avoid refuting this fact (and if you read carefully you’ll also realize that he says he just moved in the Borough but not necessarily from Kingston or Richmond). It is also true that all Outer London Boroughs bar one charge more than all Inner London Boroughs, and this is due to the fact that they all receive much less Government Grants, also for the reason that they are wealthier, and since they must deliver the same services the difference can only be found through Council tax. It’s a redistributive measure to make those that need more receive more and those that can afford more pay more, and in fact the two Boroughs that Mr Watkins chose to focus on are two very wealthy Boroughs indeed, that therefore receive a much lower government grant from central government to integrate the collected Council Tax. For each resident the Royal Borough of Kingston upon Thames receives a yearly grant of £231, the London Borough of Richmond receives £150. The latter is in fact the London Borough that receives less grants than all other Outer London Boroughs. The London Borough of Lewisham receives £715 for each of its resident! In his letter Neil Watkins points specifically at Kingston’s Band D Council Tax and says it’s 30% higher than here. Let’s take a look at this specific. First of all this is factually incorrect, to be precise it’s 24.7% (Lewisham is 1,351.92 and Kingston is 1,685.88), but mostly, since Lewisham Council receives for each resident a grant that is £484 higher than what Kingston receives then Kingston must have a higher Council Tax to deliver the services it must deliver. If Lewisham had to add the same £484 to the tax it charges then Lewisham’s Band D would be £1835, 92 and that’s £150 above what Kingston charges. Band D Council Tax for the London Borough of Richmond is £1,597.21 , and this despite the fact that it receives a paltry £150 of central grant per resident, that’s a staggering £565 less than Lewisham. If Lewisham would add that to what it charges then Band D here would be £1916.92. In conclusion, after adjustment to consider the different Government Grant received by each Borough it emerges that the Labour run Lewisham charges a Band D Council Tax that’s 8.9% higher than Lib Dem run Kingston and 20% higher than Lib Dem run Richmond. P.S. : to make this calculation I made here the assumption that each individual resident is also a Council Tax payer. This is not true because the Council tax is instead a tax on the property, and since each property is on average the residence of more than one person it means that Lewisham charges in real terms even more than that when compared to Richmond and Kingston. Lewisham has been successful in receiving funding from the London Development Agency to reduce CO2 output by 20.12% for an area in Hither Green and Ladywell. This is an exciting project that will bring together residents, businesses and organisations operating in the area to all reduce their CO2 output. We would like to invite all community members to attend this highly informative event and hear from you what projects you would like to see happen in the area and how we can all work together to deliver a low carbon community. Last week’s crash on Lewisham High Street by the Courthill Road junction is reported in this week’s South London Press and the Mercury. we are currently investigating whether we can improve facilities for pedestrians at the junction of Courthill Road with Lewisham High Street. I’m also pleased that the very important data that the junction saw 21 accidents in the past three years is now in the public domain through mainstream media. Campaigner Max Calo said: “It’s the 21st accident on the junction in three years. “TfL’s argument that they don’t want to have tighter regulation with traffic lights because it will affect car flow is wrong. “When there is an accident you break the flow of traffic for hours because the road has to be closed, so their argument is wrong. “The junction is occupied by cars most of the time so an emergency vehicle will find it very hard to cross there because there are always cars stuck in the middle. The main entrance for Hither Green is in Staplehurst Road so that entrance automatically gets gritted, however, the other entrance in Nightingale Grove was not included so has only been gritted on request. We will make sure in future that both entrances to Hither Green are gritted, subject to salt stocks being available. What makes the Staplehurst Road side the main entrance I don’t know, but the fact here exposed is that in the eyes of officialdom the Lewisham Central side of Hither Green plays second fiddle. We have now won the promise that subject to salt stock being available it will be gritted in case of ice and snow, but this is only the start. We shall demand nothing less than full equality of status for both ends of the tunnel. 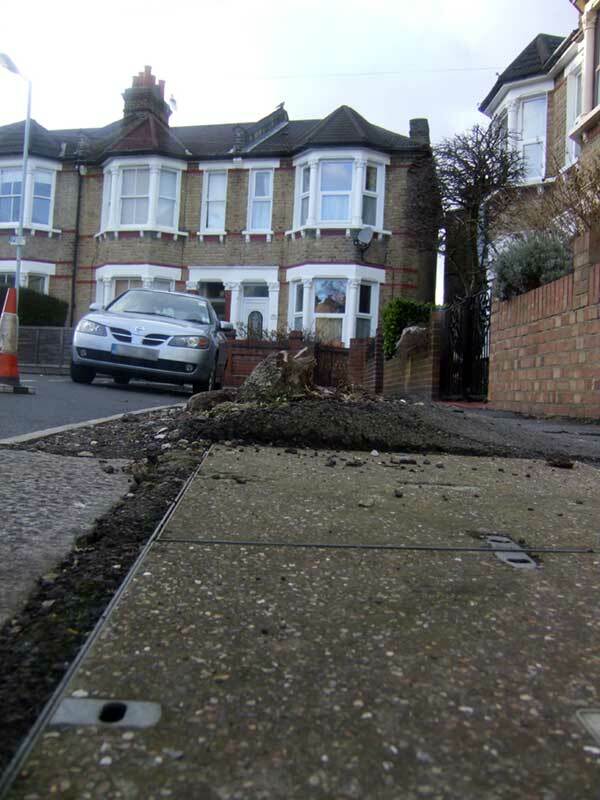 Speed humps are useful but not universally loved, Lewisham Council loves them so much that it even placed one in front of a wall at least once. But now we have a new road feature, it’s the slow hump! 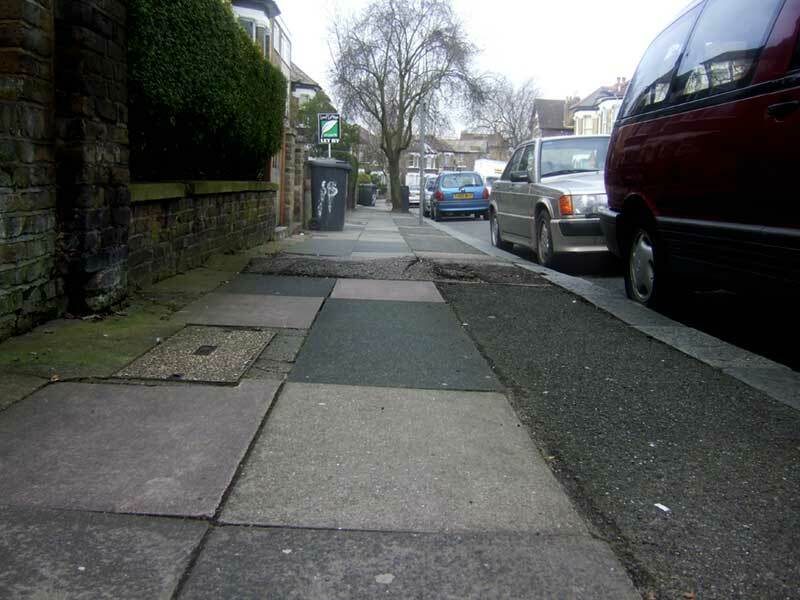 The pilot of this scheme is currently ‘on duty’ slowing down dangerous prams and wheelchairs in Mount Pleasant Road. There used to be a tree there and the hump came into being as a result of roots pushing up the pavements, but a few months ago Lewisham Council cut down the offending tree and left behind an unspeakable mess. The tree was only cut at surface level, and the stump left in the ground patched up so badly that splinters are still visible piercing through the concrete. Worse still, the root itself has been left in place, with the result that without the tree warning pedestrians don’t have visual notice that the surface is so uneven. Truly dangerous. 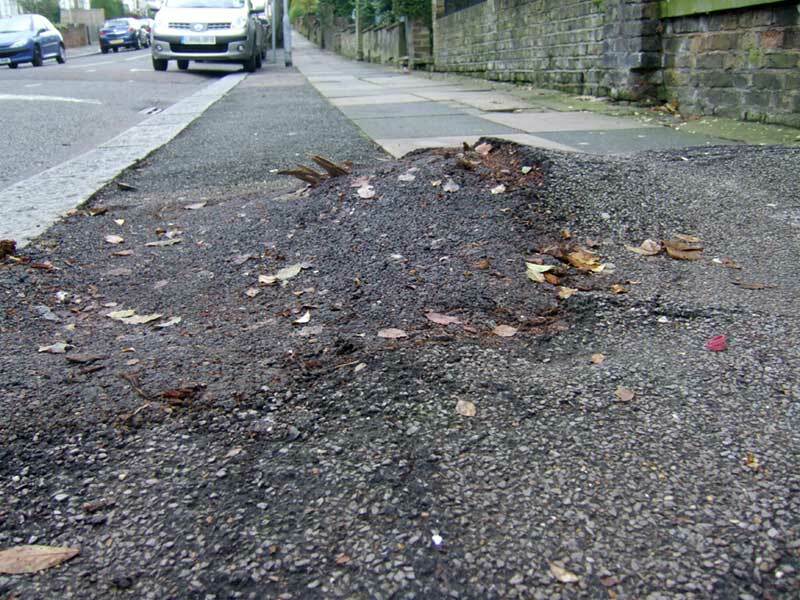 I saw another example of these kind of botched jobs around the ward, this is in Brightside Road, here instead of a hump there’s a volcano type of display. With thanks to all the Lewisham Central and Lee Green residents that in the past few weeks signed this petition outside Hither Green Station. Two police officers and a member of the public were hurt when a car answering an emergency call collided with another vehicle in south east London. The Metropolitan Police said the accident happened in High Street, Lewisham, just after 1000 GMT. All three people were taken to hospital following the crash but the extent of their injuries is not yet known. The marked police car is believed to have had its lights and sirens on when it collided with the Vauxhall Zafira. Lewisham traffic was seriously disrupted today when following this accident at Lewisham High Street at the junction with Courthill and Whitburn Road the junction was cordoned off for hours (this video was taken almost three hours after the accident), effectively cutting the flow of cars and buses in two. This time it was a police car in emergency to have an accident at this junction. Police cars often go through red lights and take a risk when in emergency and sometimes the risk ends up like this, so one can say that this could have happened at any other junction. Still, this is the 21st collision in about three years at this junction (five involving pedestrians). Best wishes of a quick recovery to those involved. Click on the Courthill Road tag to read more about this junction. The Mercury reports an incredible turn of events for Lewisham Town Centre, the Housing Minister John Healey has in fact announced that the Government will give £20.5m to Barratt Homes to allow the development at Loampit Vale to proceed. We have used the power of public investment to ensure that even in the downturn we continue to build the homes the country needs. But I want to make the best of every taxpayer’s pound, which is why I am requiring those benefiting from this extra cash to offer local job and apprenticeship opportunities. I really thought that there already were incentives for local jobs and apprenticeships. £20.5m sounds a bit dear for just one development. Could it be that the Housing Minister is helping the Labour administration of Lewisham to save the face before an election with quite a bit of our money? The negotiation for this development was a masterpiece in incompetence, this deal was signed off during recession but using a financial model developed during the housing bubble. Even a donkey would have known that it couldn’t work. Not Mayor Bullock though, he signed off the transfer of the most valuable plot of public land in the Borough to a developer on the back of an unrealistic deal, and if after this mess the Government would not have intervened with an unprecedented £20.5m handout to the land developer we would have remained with that hole in the ground in front of Lewisham Station for years to come. By the way, when Loampit Vale was approved I made the prediction that Barratt would have come back with new requests in order to proceed, on that count I was right. I thought that they would have asked for more storeys to be added or a reduction in social housing. I’d have never thought that it would have been an all out handout of tens of millions in cash. At last Council meeting held this Monday 1st march Cllr Alan Hall, who is leader of the Labour group at Council, did a serious bit of grand-standing against Liberal Democrat disclosure of Councillor’s expenses. His high sounding speech explained to all mortals that the £1300 taxi bill of Councillor Sylvia Scott was thoroughly justified by the fact that she is Vice Chair of the Council and as such wears a “Chain of Office” and you wouldn’t want to see someone wearing a Mayoral Chain going up and down buses. I’m not sure I buy the argument in the first place, Ken Livingston never minded using buses, Boris Johnson cycles, and anyway Councillors receive an allowance that they can spend on cabs if that’s the way they want to travel for duties on those occasions that are not normally covered with extra expenses. But there is another reason why Councillor Hall grandstanding is completely void of merit, and that’s that we are talking of the 2008/09 expenses, when the Vice Chair of the Council was Cllr Smith (who claimed no expenses at all), not Cllr Scott. You don’t need a degree in media study to know that a paragraph of Government sponsored pseudo-news that contains the word “apparently” twice is “apparently” very dodgy. Because Miliband gets new plan to curb emissions is “apparently” just that. Now, the London Borough of Lewisham has been for decades at the cutting edge of the production of hot air, so the step to micro wind turbines is only natural, but I really think we should object to it. The people who sell solar photovoltaic (PV) panels and micro wind turbines in the UK insist they represent a good investment. The arguments I have had with them have been long and bitter. But the debate has now been brought to an end with the publication of the government’s table of tariffs: the rewards people will receive for installing different kinds of generators. The government wants everyone to get the same rate of return. So while the electricity you might generate from large wind turbines and hydro plants will earn you 4.5p per kilowatt hour, mini wind turbines get 34p, and solar panels 41p. In other words, the government acknowledges that micro wind and solar PV in the UK are between seven and nine times less cost-effective than the alternatives. It expects this scheme to save 7m tonnes of carbon dioxide by 2020. Assuming – generously – that the rate of installation keeps accelerating, this suggests a saving of about 20m tonnes of CO2 by 2030. The estimated price by then is £8.6bn. This means it will cost about £430 to save one tonne of CO2. Last year the consultancy company McKinsey published a table of cost comparisons. It found that you could save a tonne of CO2 for £3 by investing in geothermal energy, or for £8 by building a nuclear power plant. Insulating commercial buildings costs nothing; in fact it saves £60 for every tonne of CO2 you reduce; replacing incandescent lightbulbs with LEDs saves £80 per tonne. The government predicts that the tradeable value of the carbon saved by its £8.6bn scheme will be £420m. That’s some return on investment. This is one of the worst possible uses of our money in the name of the curbing carbon emissions and saving our environment. It doesn’t stimulate the green economy, it doesn’t produce appreciable amounts of energy, and most of all, it doesn’t have a meaningful impact on the environment for the money spent. Buying a solar panel is now the best investment a householder can make. The tariffs will deliver a return of between 5% and 8% a year, which is both index linked (making a nominal return of between 7% and 10%) and tax-free. The payback is guaranteed for 25 years. If you own a house and can afford the investment, you’d be crazy not to cash in. If you don’t and can’t, you must sit and watch your money being used to pay for someone else’s fashion accessory. It’s one of those pacts with the devil that ultimately damage the same reason they claim to be supporting, like selling weapons to Saddam Hussein to further stability in the Middle East. That worked! Those who hate environmentalism have spent years looking for the definitive example of a great green rip-off. Finally it arrives, and nobody notices. The government is about to shift £8.6bn from the poor to the middle classes. It expects a loss on this scheme of £8.2bn, or 95%. Yet the media is silent. The opposition urges only that the scam should be expanded. Monbiot is right, this is about people living in flats paying more for their electricity in order to subsidize the solar panels and wind turbines of those that fitted them on top of their house. The environmental impact of this grotesque parody of environmental policy is negligible. Those countries that have gone down this route years ago are now getting out of it as all evidence shows that the amount of energy generated is minuscule, emissions cut are nil. We don’t need to guess the results: the German government made the same mistake 10 years ago. By 2006 its generous feed-in tariffs had stimulated 230,000 solar roofs, at a cost of ¤1.2bn. Their total contribution to the country’s electricity supply was 0.4%. Their total contribution to carbon savings, as a paper in the journal Energy Policy points out, is zero. This is because Germany, like the UK, belongs to the European emissions trading scheme. Any savings made by feed-in tariffs permit other industries to raise their emissions. Either the trading scheme works, in which case the tariffs are pointless, or it doesn’t, in which case it needs to be overhauled. The government can’t have it both ways. A week ago the German government decided to reduce sharply the tariff it pays for solar PV, on the grounds that it is a waste of money. Just as the Germans have begun to abandon their monumental mistake, we are about to repeat it. This scheme appropriately starts on 1st April. There isn’t much time left to try and oppose it. At local level we can ask Lewisham Council, which is an enthusiastic supporter of this scheme, to withdraw from it. If that would happen then the Government may decide to take notice of the criticisms moved towards this wasteful, even counterproductive, ill-conceived policy.